When Christ in the Blessed Sac­ra­ment is moved on Holy Thursday to a tabernacle in a different location to represent his time in the tomb after his crucifixion, Catholics have an opportunity to follow and pray there as a way of entering into the Passion, liturgical ministry professionals say. Transferring the Blessed Sacra­ment is primarily a way of safeguar­ding the consecrated hosts needed for the Good Friday liturgy when none can be consecrated, said Michael Sil­havy, a member of the archdiocesan Parish Services Team. 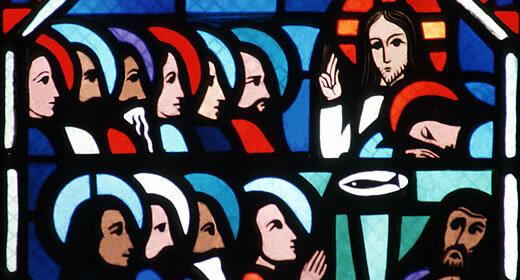 But the practice, which dates back to the Middle Ages, also offers Catholics an opportunity to reflect in their parishes on the institution of the Eucharist, as well as the events commemorated during the Paschal Triduum, which continues through Good Friday, Holy Saturday and ends on the evening of Easter Sunday. The main purpose should not be confused, said Jesuit Father Joseph Weiss, pastor of St. Thomas More in St. Paul. Some parishes maintain the time after the Holy Thursday liturgy for silent prayer, while others periodically read Scripture or lead prayer to help the faithful enter into the mysteries. At a tabernacle in a side chapel where the Blessed Sacrament is reposed, St. Thomas More offers a vigil concluding with night prayer at 10 p.m., Father Weiss said. Gospel readings every half hour punctuate the period of silent prayer. The Basilica of St. Mary views the entire Tri­du­um as one continual prayer time, said van Parys, adding that the church remains open all night after the Holy Thursday liturgy. The faithful can pray compline (night prayer) every half hour or pray silently. The Latino community at Incar­na­tion-Sagrado Corazon de Jesus in Minneapolis reads Isaiah 53, which focuses on Christ’s Passion, during the procession to transfer the Blessed Sacrament to a tabernacle in the sacristy, said Brad Capouch of Sagrado Corazon de Jesus. In the community’s tradition, when participants leave the church they receive a small loaf of bread commemorating the Last Supper, said Deacon Carl Valdez, who serves the Sagrado Corazon de Jesus community. Visiting and praying with the reposed Blessed Sacrament at different parishes on Holy Thursday is another custom believed to have originated in the early church. Distance between parishes may be one reason the practice isn’t as common here as in some European countries, Father Weiss said.